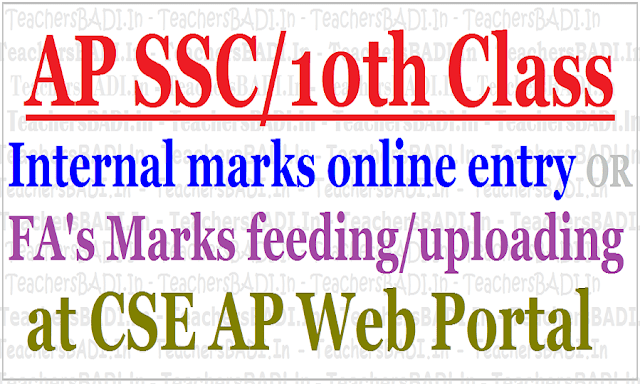 AP SSC internal marks(FAs) Online entry/ feeding/ uploading at http://cse.ap.gov.in/dse/~AP SSC internal marks online feeding: AP SSC 2017 internal marks online uploading, AP SSC internal marks online feeding, AP SSC Internal marks Online entry instructions, AP SSC Formative Summative Assessment marks entry, AP SSC FAs SAs Marks entry, SSC Internal Marks Feeding Website has been started at CSE AP Web Portal. CSE AP given instructions to all DEOs for Feeding of AP SSC Internal marks on web portal http://cse.ap.gov.in/DSE/. Feeding of AP SSC Internal marks at http://cse.ap.gov.in/DSE/. DGE has informed to all DEOs that the internal marks (FAs) have to be uploaded by the Headmasters for Regular candidates pertaining to SSC Public Examinations March 2017 on web portal http://cse.ap.gov.in/DSE/. In this regard all the District Educational Officers are requested to make arrangement for feeding Internal marks (FAs/SAs) duly instructing Deputy Educational Officers to monitor the process of work day to day basis till the work is completed. Other important instructions also have to be followed without fail. #Username/User Id: SSC New School Code (12xxx). 1) Visit one or two schools every day and ensure that the schools are entering the internal marks accurately and see the work is completed as; per schedule. 2) Review with the Deputy Educational Officers and get their visit reports every day. 3) Arrange trainings for Deputy Educational Officers and Headmasters on the subject. 6) Collect one copy of the internal marks from all the Schools through Deputy Educational Officers and arrange to send them to the Office of the Director of Government Examinations on the scheduled date. 8) At any circumstance the feeding of internal marks schedule will not be extended. All the Heads of the institutions is hereby informed that the uploading of formative assessment marks through web http://cse.ap.gov.in/DSE/ pertaining to SSC Public Examinations, March, 2017. No further extension will be given under any circumstance.